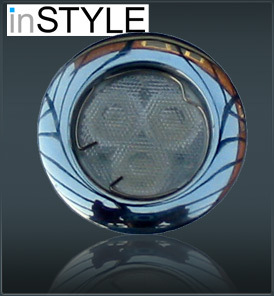 The Instyle Hi Lux Optic RGB Downlighter consists of 3 high powered 1 watt Cree x lamp 7090 Leds. Cree leds lead the industry in brightness and efficiency for solid state lighting applications. Add to this a 3 way precision optic with clip on beam angle lens then you have a product at the top of its class. Full colour mixing can be achived by using the DMX addressable power supply IND36 colour driver. For ease of installation there are 2 RJ45 sockets fitted to the back of the fitting and are easily linked together using cat 5 cable with RJ45 male connectors. Each fitting comes complete with a chrome MR16 Mounting kit. The Instyle Hi Lux Optic RGB IP 67 In ground uplighter consists of 3 high powered 1 watt Cree xlamp 7090 Leds.